In December 2013 the St. Mary’s Children and Community Hospital opened its doors. At the time the CSSD was equipped with an advanced autoclave for the sterilization department: A Matachana LR80-1. At the time it was installed it was anticipated that the machine was not suitable for its setting. Soon indeed it broke down and since 2014 the hospital had to rely on a pressure/cooker type autoclave. A new more basic autoclave was procured and materials for the repair of the Matachana autoclave were ordered and received early in 2015. 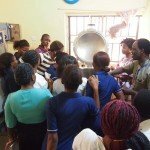 In October 2015 the Dutch consultant Jan Huijs and his Nigerian colleague James Orsugh could come for a 3 week visit to install the new autoclave, repair the Matachana autoclave, offer advice and perform training for staff. The new autoclave could be installed in the CSSD. In collaboration with the technical team the autoclave was connected to the electricity supply, water supply and drain. Test running resulted in optimizing the pack size for the process. The Matachana autoclave had been worked on by other technicians, however could not be repaired. Wiring was loosened and changed; water level sensors of the steam generator interchanged. The vacuum pump was considered the major problem. During the visit the problems were analysed; the vacuum pump exchanged and issues related to the wiring resolved. Test running could be done again. However the machine allowed only a single reliable cycle at the beginning of the day when the water is still cold. A cycle per day would however remain sufficient production per day. The manufacturer is being contacted on this issue. The small pressure cooker that was in a very poor state: a plastic tube used to close a the connection of a broken down valve was about to burst; the pressure gauge was not working; the electrical connection is extremely poor and dangerous and the trivet for keeping the tray above the heating element was causing corrosion and rust sediments on the chamber, tray and instruments. The autoclave received a full overhaul with new trivet, pressure gauge and adequate closing of the hole of the missing valve. An adequate sterilization cycle has was established. Storage time of goods sterilize in the pressure cooker has been too long resulting in serious growth of fungi in sterile packs. The storage time for these packs was reduced to a maximum of 2 days. Cleaning of instruments revealed short comings: corrosion and serious residues on instruments ready for use were observed. Cleaning practice was improved and new brushes were issued. Packaging of sterile packs caused the need of complicated handling for opening them; thus leading to increase chances of recontamination. Adequate packaging methods were trained on, enabling aseptic opening of the packs. In order to improve the quality and procedures in sterile supply a 5 day training was organized. It included a theoretical part during with principles of infection control were explained. Followed by the basics on physics required to understand the operation of the steam sterilizers. 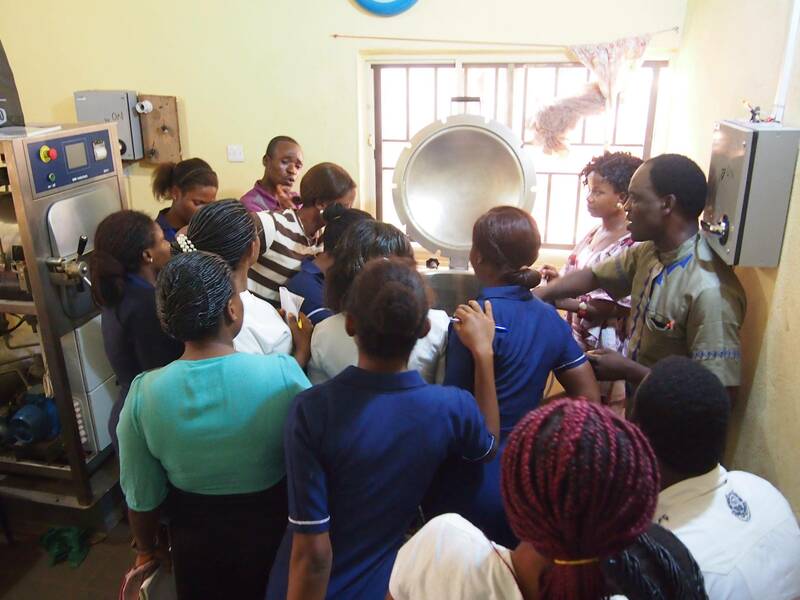 The construction and operation of the sterilizers were explained and followed by hands on practicals on their operation in the sterilization department. The training started with an pre test and was followed by a post test thus enabling evaluation of the performance of the students. The score increased an average of 20%, a considerable improvement. All participants that attended the full training received a certificate of attendance. With and enthusiastic song and lots of happiness outside at the entrance of the hospital the training was closed. The training revealed a desperate need on improving knowledge on basic issues such as quantities and units, principles of physics and calculations! Within the medical field such basic knowledge is crucial and it is strongly recommend to organize more training in order to improve these skills. During the last days still several workshops were held on cleaning packaging and a training session on the Matachana autoclave. In order to improve infection prevention in the OR building a red line was marked in the lobby thus separating the dirty area and clean area of the building. Beyond the red line a strict clothing protocol will be in place. With all lessons learnt, the new equipment and procedures the hospital made another quantum leap in its mission in improving patient care. It was great to be involved in this effort!